Many of the best plants for rock gardens happen to enjoy full-sun conditions. Plants that can survive the fast-draining, rocky soil found in most rock gardens are often drought tolerant. Though these plants are sturdy, make sure that you water rock garden plants regularly the first year after planting to help establish a deep root system. Plants with a clumping or cushion-forming growth habit are great for rock gardens where you don't want the plants to spread. Most of these are perennials, but some annuals like dianthus (Dianthus barbados) and alyssum (Lobularia maritima) also work for full-sun rock gardens. and 'White Uniform' (Campanula carpatica 'White Uniform'), which reach 6 to 12 inches tall. Sea Thrift (Armeria maritima, USDA zones 4 through 8): Sea thrift grows best in well-drained soil, and also tolerates poor soil and drought. It has a mounded shape and reaches 6 to 12 inches tall and wide. White, red, violet or pink flowers appear late spring and early summer on stalks that rise above the foliage mound. Sun Rose (Helianthemum nummularium, USDA zones 5 through 8): Sun rose needs well-drained soil that doesn't stay moist. 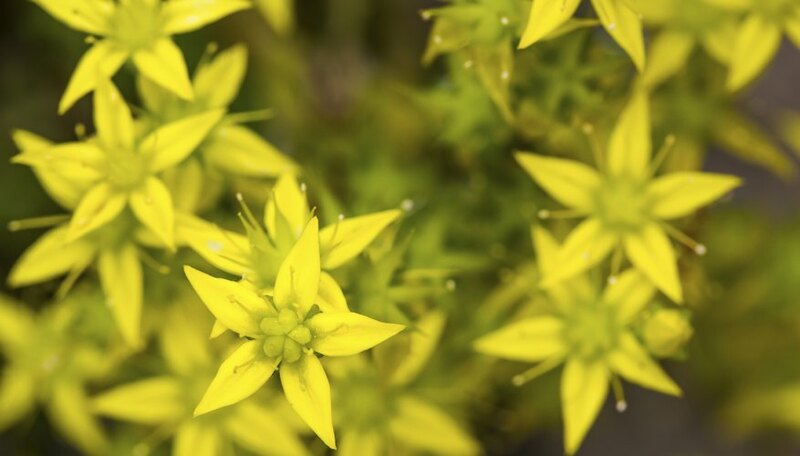 It blooms in late spring and early summer, with pink, orange, yellow or white flowers. Plants form mounds 6 to 12 inches tall and 1 to 3 feet wide. When designing a rock garden, it's often a good idea to choose clumping plants that don't spread. This ensures you won't end up with a garden overrun by just one type of plant. Spreading plants are a good choice in some situations, though, such as if you have a large rocky area with small pockets of soil or when you want rapid plant cover. Creeping Thyme (Thymus praecox arcticus, USDA zones 5 through 8): One of several species known as creeping thyme, this plant is a fast-growing ground cover well adapted to rocky soils in full sun or part shade. It grows 2 to 6 inches tall, and blooms purple in the summer. Goldmoss Stonecrop (Sedum acre 'Goldmoss,' USDA zones 3 through 8): This fast-growing sedum thrives in full sun and well-drained soil. Plants grow 1 to 3 inches tall and spread about 2 feet. It has yellow flowers in late spring. Many of the plants grown in rock gardens are native to mountain regions. 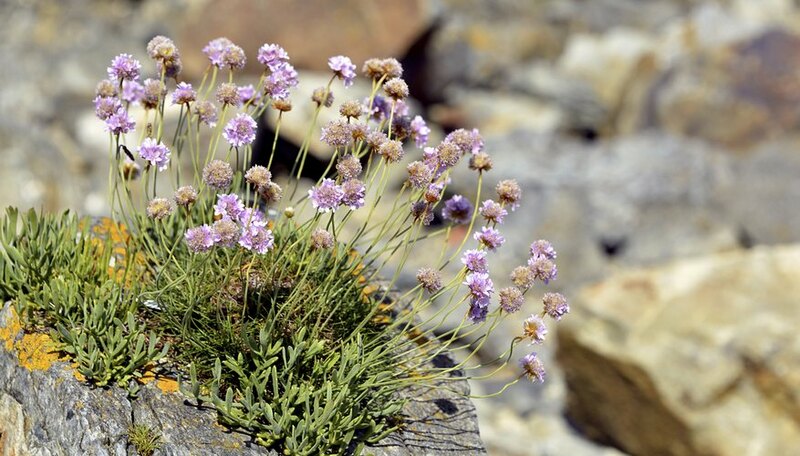 Some of these alpine plants are hard to find or grow best only at high elevations. Others, however, are not only easy-care plants, but also very sturdy for hot, dry and sunny conditions. They typically have deep root systems, and need about 18 inches of soil depth in the rock garden. 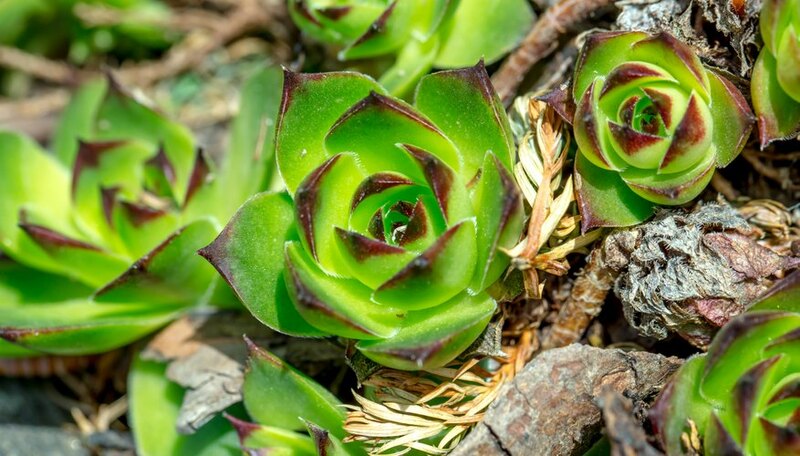 Common Houseleek (Sempervivum tectorum, USDA zone 3 through 11): A member of the succulent plant group, houseleeks grow about 4 inches tall and spread quickly to produce a mat of foliage. They need well-drained soil and thrive in full sun. False Rockcress (Aubrieta deltoidea, USDA zones 4 through 8): This non-aggressive mat-forming plant grows 6 to 9 inches tall and spreads 1 to 2 feet. It grows best in well-drained soil, and is very drought tolerant. False rockcress flowers mid-spring through early summer, with blooms in white, pink, red or purple. Pasque-flower (Pulsatilla vulgaris, USDA zones 5 through 8): Growing 8 to 16 inches tall and wide, this clumping plant will grow in any soil type and is very drought tolerant. It blooms in the spring, and both its flowers and seedheads are showy. The roots are very deep, so don't try to move it once it's established. Shrubs often form the backbone of landscape beds, and you can use them in full-sun rock gardens as well. Though dwarf shrubs are compact, ensure you provide room for their mature spread and soil at least 18 inches deep. Alpine Carpet Juniper (Juniperus communis 'Mondap,' USDA zones 3 through 6): This compact alpine shrub is one cultivar of a species native to the Rocky Mountains. Drought tolerant once established, its mature size is 8 inches tall and 3 feet wide. Japanese Spirea (Spiraea japonica 'Alpina,' USDA zones 4 through 9): This dwarf plant requires well-drained soil. Water enough to keep the soil from drying out completely. It has showy light-pink flowers in the summer. 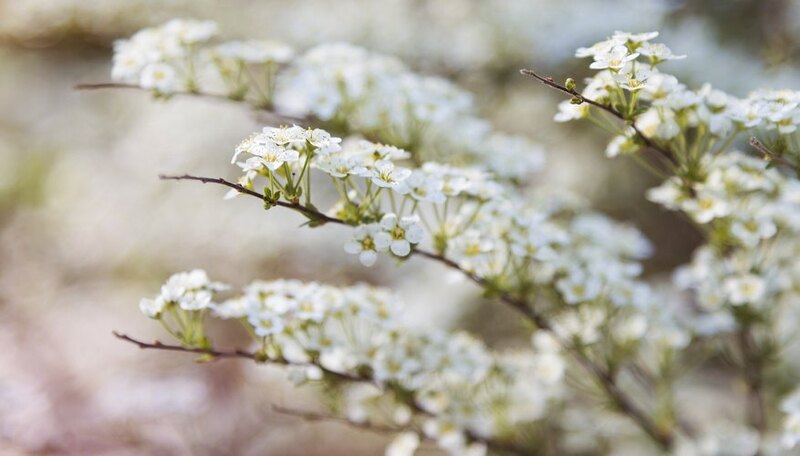 Japanese spirea grows 6 to 12 inches tall, and 1 to 3 feet wide. In large rock gardens, you might want some height from taller landscape plants. Small trees are a good choice for this. Like shrubs in the rock garden, they need enough extra room for their root systems to grow. Blue Cloak White Fir (Abies concolor 'Blue Cloak,' USDA zones 4 through 8): This dwarf conifer has powder-blue foliage and grows in a pyramid shape. It needs water when the top 3 inches of soil is dry. It can reach 7 to 10 feet tall and 3 to 4 feet wide. Dwarf Balsam Fir (Abies balsamea 'Nana,' USDA zones 3 through 6): This plant needs regular water in dry weather. Dwarf balsam fir grows slowly, and can eventually reach 2 to 3 feet tall. Mugo Pine (Pinus mugo, USDA zones 2 through 7): Native to the European Alps, this tree grows well in full sun to partial shade. It matures at 10 feet tall and 15 feet wide. 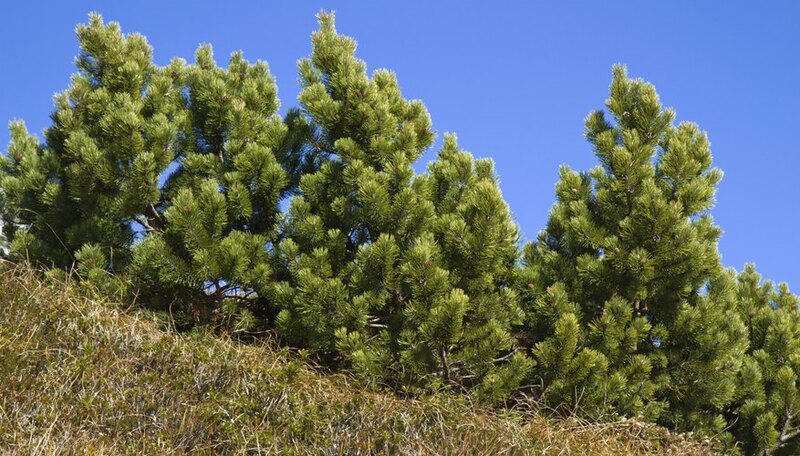 The more compact 'Big Tuna' Mugo pine (Pinus mugo 'Big Tuna') reaches 6 to 8 feet tall and 4 to 6 feet wide. Water during extreme heat.